NASHVILLE, TENNESSEE -Let’s face it: we are now part of the smart phone generation. You’ll notice smart phones glued to hands across multiple generations. My parents both got their first iPhones and are navigating the app world. My nephews and nieces are interacting with smart phones and tablets with ease. I’ve written before about mobile SEO. Just as SEO is constantly changing, so is the mobile world. I interviewed web and mobile app developer Mark Freeman about mobile SEO. Mark founded Red Room Software in January of 2011, and since then he’s created apps for music and voice manipulation and home studio recording. Mark’s free iOS apps have received more than 20,000 downloads in the past six months. He created the iOS and Web app Social Impact that allows users to find socially conscious businesses – sort of like Yelp for businesses with a warm, fuzzy purpose. Social Impact was a finalist for the Social Enterprise U.K.’s “Innovation for Best New Product or Service” category, and now Mark has developed a cross platform app to bring Social Impact to a much wider audience. Until now, Mark has exclusively developed for Apple devices, but the new cross platform app will work on Android, iPhones, iPads and on any web browser. And, for full disclosure – Mark is my husband. Jessica: Can you explain the difference between a website and a web app? Mark: A web app has a specific functionality that solves a certain problem. Web apps are generally more interactive than websites. For instance, the recent Social Impact App helps customers find socially conscious businesses in their areas. Websites are instead mainly just displaying information, such as here’s what our business does, here’s our content for our blog, here’s our online gallery or portfolio. Jessica: How often do you change strategies, learn new languages or adopt new techniques in your industry? Mark: Once or twice a year I learn a new language and adopt new techniques. The market moves that fast; new languages and techniques are created every few months to solve new problems or solve old problems in a new way. To keep up with the times, to make things look better and work faster, I have to constantly learn and adapt. As a software engineer, at least 50 percent of my job is to learn new technology. Jessica: How do keyword tags affect individual app pages on the Apple App Store? Can search engines see them? Mark: Search engines can absolutely see these keywords. The keywords show up in the page’s HTML, so having your app’s descriptions and keywords optimized is incredibly important in having customers find your app. These fields directly affect your search engine ranking and your app sales. The individual app pages are just websites. There’s also a category field where you can help Apple better categorize your app. App developers should be sure to include relevant, optimized keywords when they’re uploading, modifying or updating their apps. Jessica: Do you think every business needs an app? Mark: No. If the app serves no purpose, then you just have a useless piece of software that no one will use. Some businesses are more suited to have apps, such as yoga studios where you have customers interacting with a changing schedule. Entertainment venues are also good candidates for apps. They can use interactive schedules that frequently change, and their users may actually find some entertainment within the app itself. Grocery stores are great candidates for apps because they can share store specials, recipes, question and answer forums and coupons. A great benefit to having a native app for something like a grocery store is that customers can still access the app even if their phones have bad reception. Native mobile apps written specifically for certain devices can store and recall their own information, whereas the essence of a website or web app means that information is stored not on your device but on a server. 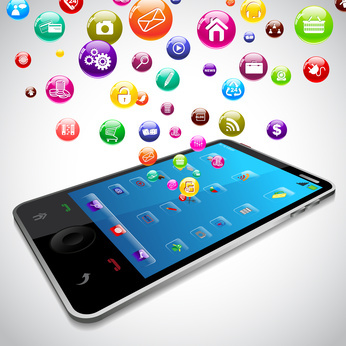 Having an app can be more engaging for certain businesses even where a website would suffice. Jessica: What SEO tips can you give us to increase exposure with a native mobile app? Mark: First of all, while search engines can easily read web apps, they can’t see content within a native app. Have a dedicated website, ideally with the domain name of your app, that you can put content on to increase your app’s exposure. That way Google and other search engines can index your website, and customers will have an easier time finding your app. The whole point of that website would be to point to your app’s download location so customers can get it on their smartphones or tablets. Jessica: What do you see changing in the future in regards to SEO and mobile apps? Mark: Well, I think companies like mine, and companies like Apple and Google see the great need for improved SEO. The app market, or app-mosphere, is saturated with apps. It’s sometimes hard to find something really relevant and good. It’s hard to find what you’re looking for, if you even know what you’re looking for. Apps sometimes have strange names that don’t clue customers in to their real functions. The next frontier for mobile and app SEO will be to cut through that saturation and better categorize your app. Customers may easily get fed up with the app market because there are so many bad apps out there and there is no great platform to find the app you’re looking for. Jessica: Thanks, Mark, for letting us pick your brain! Have you searched for apps and found what you were looking for? Do you have more questions about mobile or Web apps? I always wanted to learn mobile app development, but never got the fortune. I believe the world of internet is drifting quickly towards the smartphones domain. Thanks, Lorrie! And yes, SEO is the yellow brick road to success! Great blog post! This is yet another example of how all roads lead back to SEO. Never thought about how important a website is for an app for SEO purposes. Thanks!